Background: Most syndromes of accelerated aging are caused by mutations affecting the integrity of the genetic material. Among them, the most studied is Werner’s syndrome, “adult progeria”, caused by a recessive autosomal mutation with a frequency of 1 in 10 million, which affects a helicase involved in DNA repair. In Werner syndrome, there is a loss of heterochromatin, though the stability of heterochromatin is also affected in "normal" aging. The Hutchinson-Gilford Progeria Syndrome (HGPS), "child progeria", has an even lower frequency. In most cases, it is caused by a point mutation of a gene coding a protein in the nuclear envelope, lamin A. Objectives: HGPS may provide valuable insights into the aging process. The symptoms of this condition do not entirely overlap with those of “normal” aging. Method: A critical analysis of the accelerated aging syndromes may explain what aging is, and also why some tissues and organs age at accelerated rates as compared to other tissues. Results: In this article, we will discuss the implications of HGPS and other accelerated aging syndromes in the light of the biochemical hypothesis of aging we advanced. According to this hypothesis, some reactions are less stimulated and diminish in time, affecting not only specific biochemical functions, but cellular energy, and therefore its capacity for synthesis. Conclusion: Besides, a new vision on aging, possible therapeutic strategies for these conditions and others, with similar mechanisms, are also presented. Keywords: Progeria, werner syndrome, hutchinson-gilford syndrome, aging, fibrosis, mutation. Title:Are there Different Kinds of Aging? 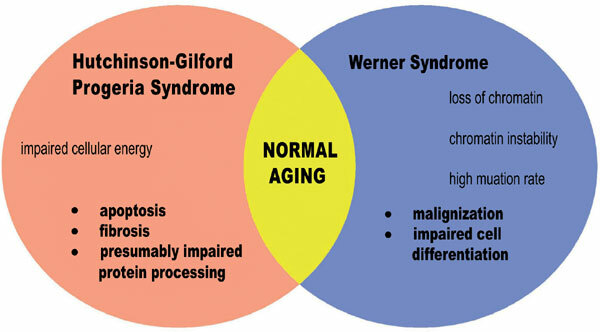 Keywords:Progeria, werner syndrome, hutchinson-gilford syndrome, aging, fibrosis, mutation. Abstract:Background: Most syndromes of accelerated aging are caused by mutations affecting the integrity of the genetic material. Among them, the most studied is Werner’s syndrome, “adult progeria”, caused by a recessive autosomal mutation with a frequency of 1 in 10 million, which affects a helicase involved in DNA repair. In Werner syndrome, there is a loss of heterochromatin, though the stability of heterochromatin is also affected in "normal" aging.